Our product range includes a wide range of aluminum conveyor. Our immense domain expertise and market knowledge help us to offer the finest quality Aluminum Conveyor. This conveyor is available in various models such as motorized roller conveyor and gravity force roller. Our professionals manufacture this conveyor by making use of optimum grade components with the help of the latest techniques. Our clients appreciate this conveyor for its use in various industries. 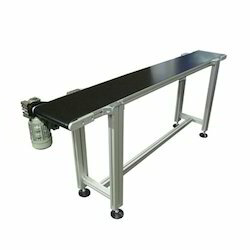 Besides, this conveyor is made available at industry leading rates to the clients.